According to the 1791 Universal Trade Directory “Stage wagons – Taylor’s Ludlow wagon from the George, Smithfield, and Green Man and Still, Oxford-street, every Sunday evening, comes in here (Bishop’s Castle) every Saturday; returns the same evening; Barn’s Bewdley wagon comes in and returns the same time: both to Robert Davies’s, the Unicorn inn. Price’s Newtown cart meets the above wagons every Saturday; and returns the same day”. 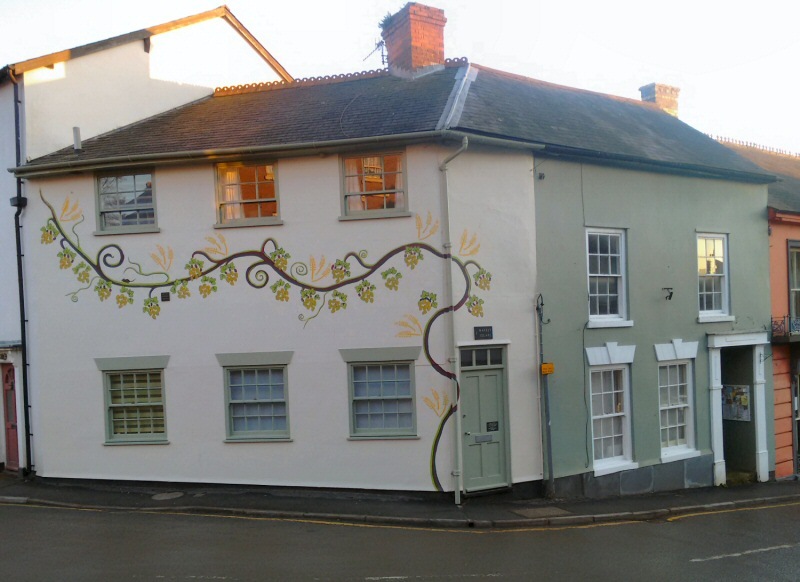 The Green Man and Still was a well known tavern and was also a coaching inn (a 1792 map shows it at the entrance to a stagecoach yard), the start point/terminus of several stage coach routes out of London. 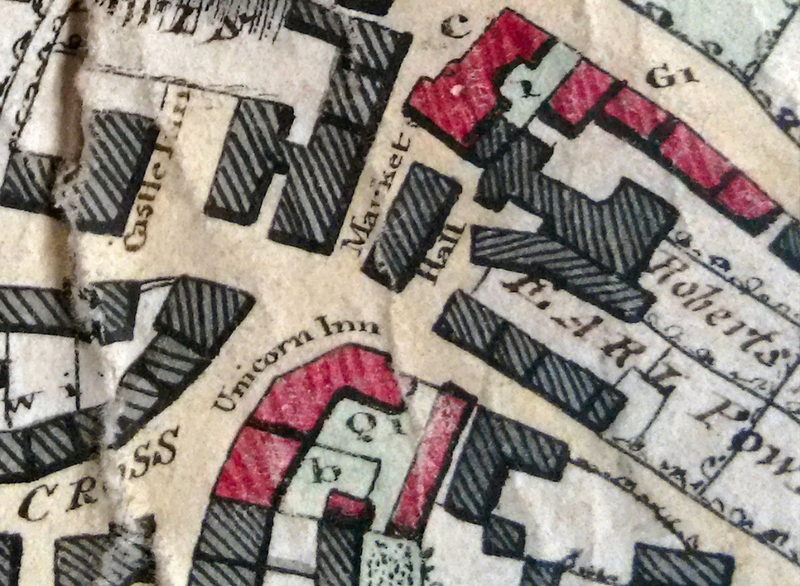 It is named and shown above in pink on the c1820 map of properties in Bishop’s Castle belonging to John Charlton Kinchant, and also listed in particulars of properties owned by his son Richard Kinchant in 1839. The tenant then was Edward Pugh, who is recorded as renting The Unicorn Inn, buildings and 2 fields called Broomy Wintles. 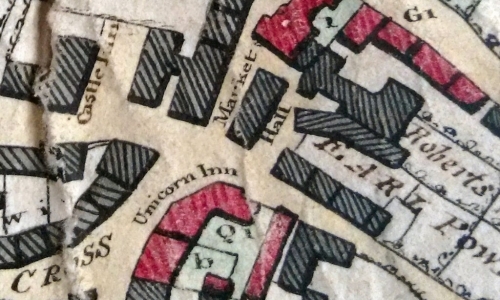 A few years later there is another Unicorn Inn, belonging to The Earl of Powis and again run by Edward Nicholas Pugh, at other end of the town in Church Street. 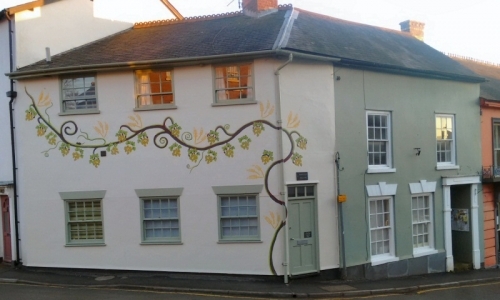 See The Unicorn Inn Church Street. No other records have been found so far, but research is continuing. Do you have any information or pictures of any of the pubs of Bishop’s Castle? We’d love to hear from you. Contact us here.